Check out what I picked off of the roof yesterday! There are lots of calendula flowering, too… if they don’t freeze tonight, I may harvest them and make a nice oil or something. 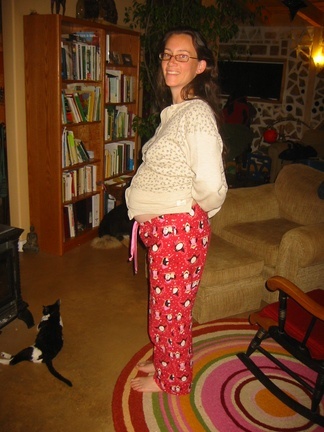 And, since I begin my third trimester tomorrow (Oh My God!! Where did time go??!!) I thought I’d post a belly picture. I really feel very large! I’m still not 100% convinced that there aren’t two in there And we already know that this child will not sleep all the time like Kaia did, ’cause he never stops moving! This entry was posted in building our home, Do It Yourself, Holistic Medicine, Mothering. Well I now realize how long it has been since we really talked! I did not know you were expecting! Congradulations! Let me know if you need anything…. 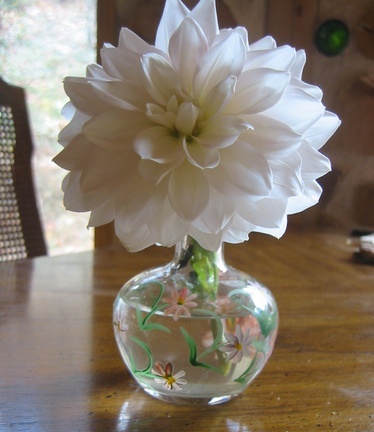 The flower is beautiful!…so is the vase. Looks like your having a big boy, your belly does look big but you could be carrying a lot of water. I got huge with both my kids. Wow, how great to have such a beautiful flower this late in the year! It’s wonderful how natures beauty and surprises can be such a delight. What would life be without flowers? Or pregnancy for that matter. What a wonderful thing to be a part of. To incubate a new life and feel it beneath your skin. oh and thanks for the comment about Dia De los Muertos. It’s good to hear that others appreciate giving death respect… much like giving new life respect!